Gil's Bayou Cottages in the heart of Ocean Springs! Private pier access! Ideally situated in the heart of Ocean Springs, Gil's Bayou Cottages are meticulously maintained cottages overlooking beautiful, historic Fort Bayou. Within easy walking distance to historic downtown shopping/restaurant district, the newly built Kingfish Cottage is perfect for romantic weekend getaways, fishing trips, girl's trips as well as week-long vacations to explore the Gulf Coast. It features a full bed, adult full/twin bunk beds, and many additional amenities for an unforgettable vacation to remember. 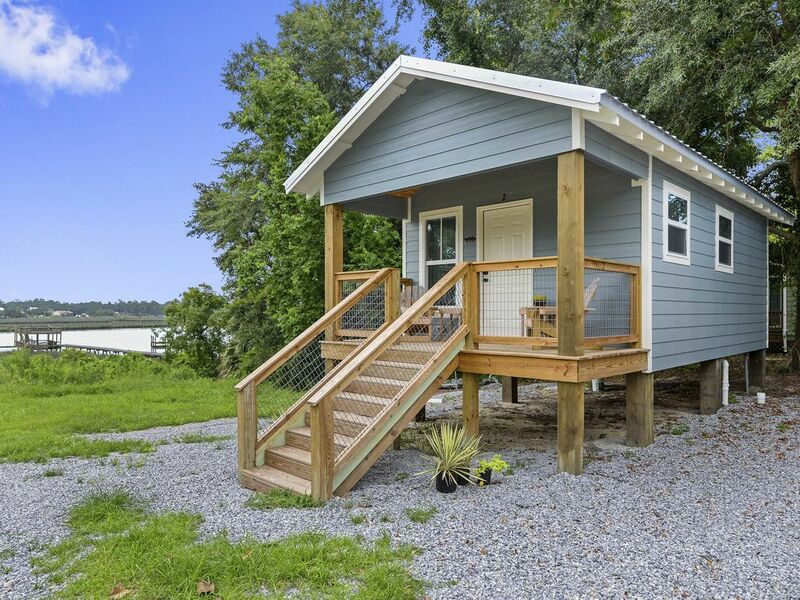 Gil's Kingfish Cottage comes with a mini-fridge, microwave, coffee maker, and you will have access to a private pier on Fort Bayou to fish or dock your boat. Gil's Bayou Cottages are the perfect place to find comfort, peace, and solace amongst the natural beauty and art-filled community of Ocean Springs. I was born in Gulfport, Mississippi in 1973. I was raised loving the Gulf and all the Coast has to offer. After working as a captain on private sportfishing yachts for almost 16 years, I gave it up to spend more time with my wonderful family back here at home. Traveling to many different coastal locales across America and the Caribbean showed me the appeal of small vacation cottages, so I decided to create these cottages with my travels in mind. It was always nice to stay in a clean private room away from the headaches of a hotel. And that's exactly what we offer: your own roomy yet cozy cottage to relax and get away. Our cottages are within walking distance of downtown Ocean Springs with a beautiful bayou view. I hope you decide to stay with us and experience what always brought me back to the one-of-a-kind Mississippi Gulf Coast! The bathroom offers a large standup shower with detachable shower wand. Shampoo, soap and linens are provided. The Kingfish cottage is located on historic Fort Bayou. A hightop dinette set is situated next to the kinchenette. A large sofa is in the living area and can double as a sleeping area for an extra guest. Very pleasant and clean cottage. Good convenient location. Would recommend to anyone. Great guest! Left cottage vey clean! Thank you! Great spot to stay for our fishing trip. Cool little place to stay. Very clean and close to everything. Will stay again. Went home to see family but wanted to have my own place to get a little relaxing time in. I was really happy I did. The little pier is nice and next time I will bring my fishing gear or maybe a few crab nets. Downtown Ocean Springs is a really cool place if you like shoping , eating or a little music and a cold beverage. And it's a stones throw away. Gil's and Aunt Jenny's is a few steps away. Easy check in and out. I would definitely recommend and will be back. If approaching from exit 50 on interstate 10, follow these simple directions to avoid U-turns prompted by your GPS. After you cross the bridge across Fort Bayou take the immediate right into Aunt Jenny's Catfish restaurant. Follow roadway back under bridge to access Legion Lane opposite Aunt Jenny's. This is a very safe well lit area.